Season the pork slices with salt and pepper and then dredge them in the flour, shaking off any excess. 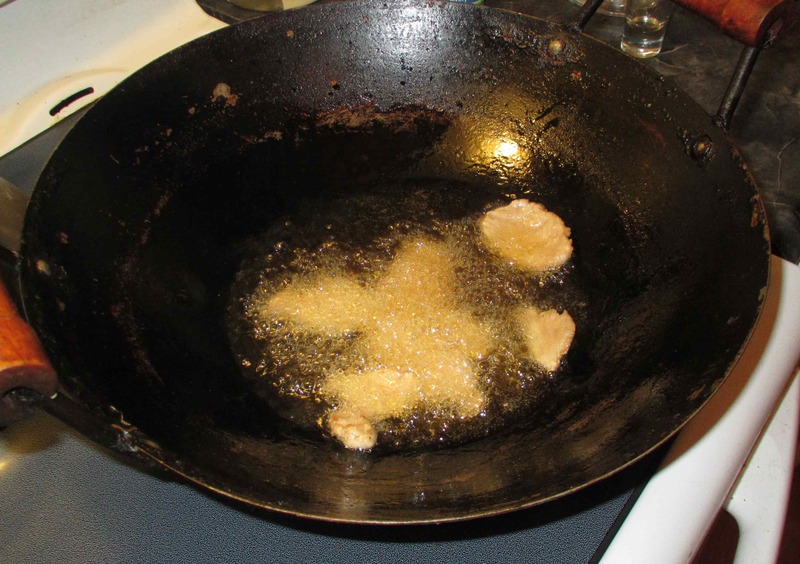 Now, heat a cup of oil in your wok over moderately high heat and then, working in small batches, quickly fry the pork. As the pieces become cooked, remove them to a bowl and set aside for the time being. The slices should be just browned and turning crisp along the edges but still moist and only just done on the inside. 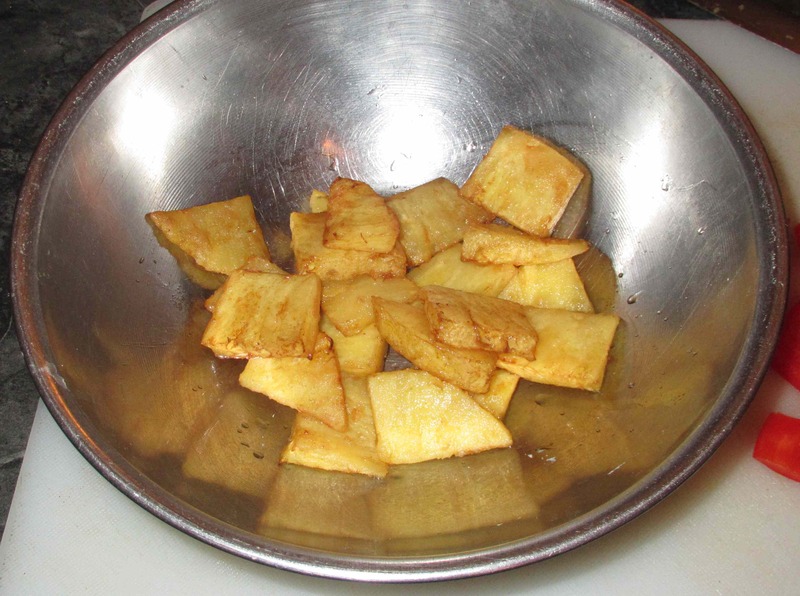 Next, toss the pineapple chunks with a teaspoon of the sugar and coat in flour as you did with pork and fry in the hot oil until just barely beginning to brown. 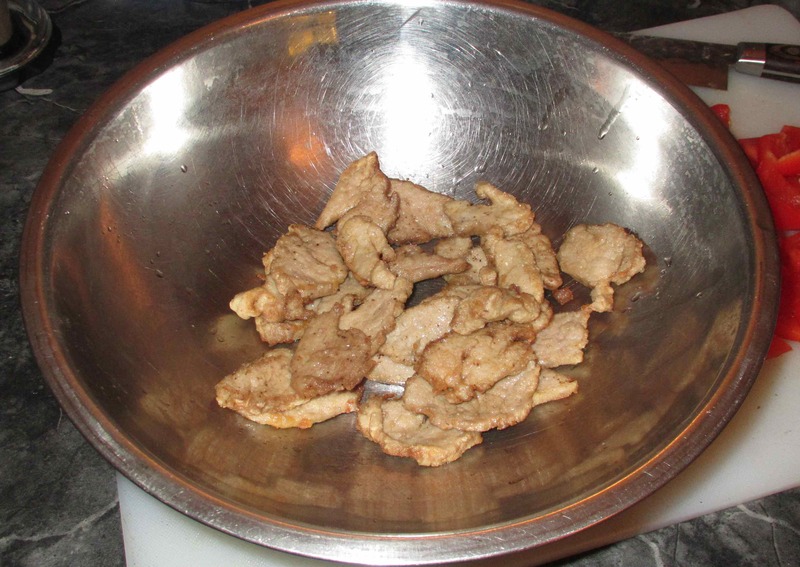 Remove the pieces to a bowl separately from the pork. 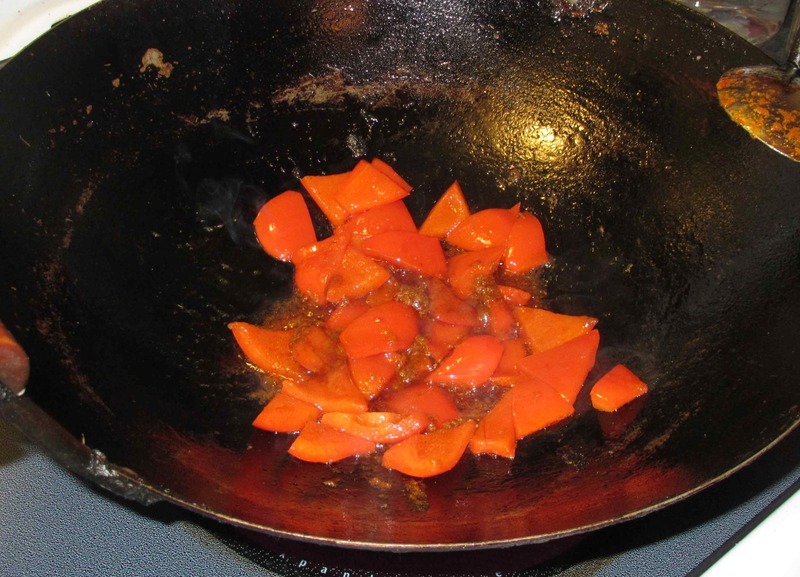 Pour off all but two tablespoons of oil from the wok and then add the bell pepper pieces, stir-frying until just softened slightly. Now, add the sugar and the Tom Yum paste and stir a few moments longer until you can smell the spicy aroma. 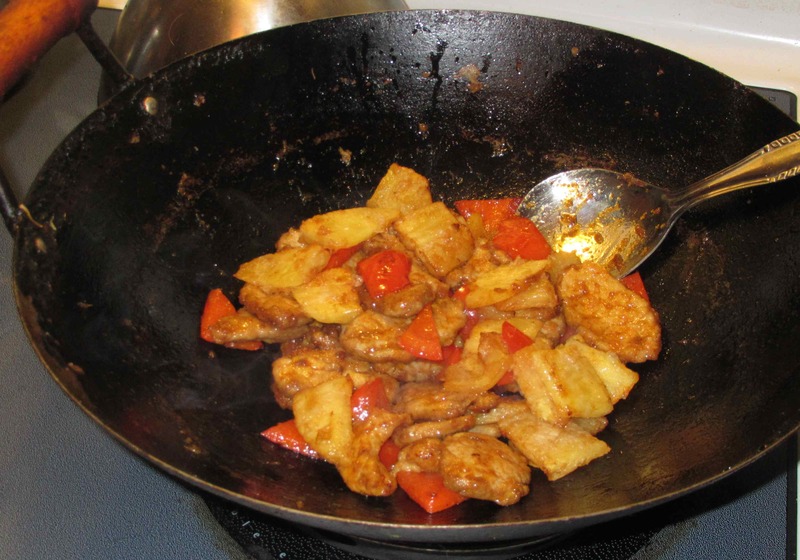 Add back the meat, stir-frying to re-heat and then add the pineapple, tossing gently until the chunks are also hot all the way through. Plate and then serve immediately, garnishing with some chopped scallion, if desired. This looks delicious! I love it when an experiment works well! Looks very tasty! I am also interested in your rice. I never mad rice like. This. Any tips? 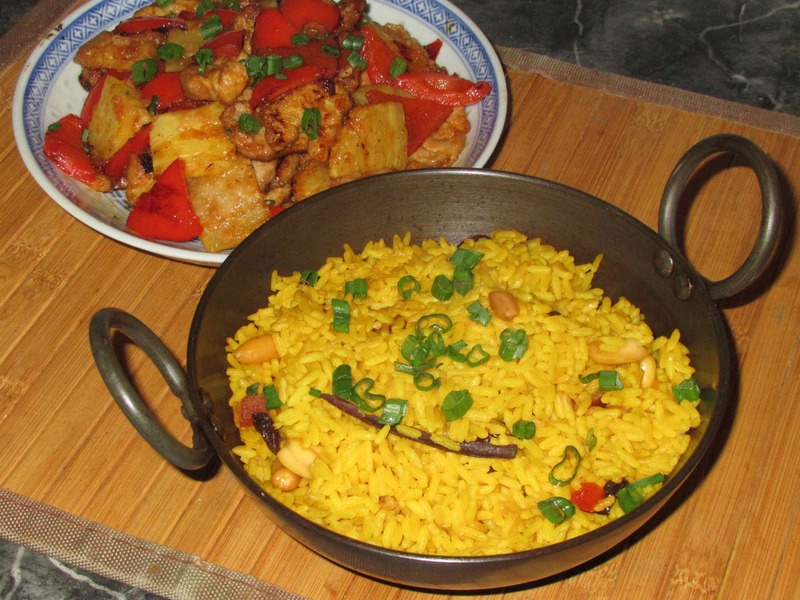 This dish here https://sybaritica.me/2012/09/17/rice-with-turmeric-paste/ is pretty much the same basic idea exept that in that case I used turmeric paste rather than the dry turmeric powder I used here … a few of the other additions are different but the principle is the same. Thank you. I found that WordPress has some problems. I didn’t see your blog on my reader and your reply too. I may try using turmeric paste next time. I love this dish, thanks for sharing the recipe! 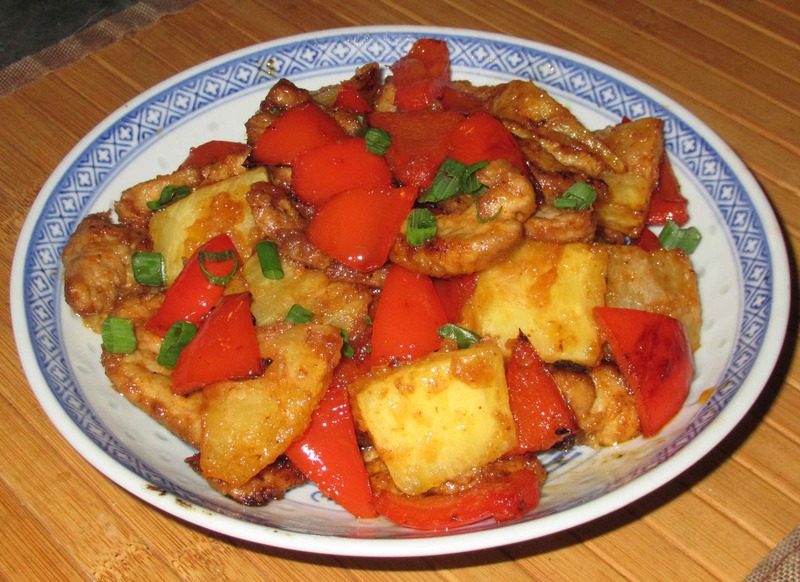 Reading about this dish and looking at the pictures is making me hungry and I am going to add this to my list of dishes to make. I do love pineapples.